HexaGroup recognized for marketing excellence with highest honor in website category. "We are thrilled to be recognized for our website development capabilities," said HexaGroup President Arnaud Dasprez. "We strive to meet our clients' marketing needs through our services and are honored to receive this award." HexaGroup received a Gold Award of Excellence in the Websites – Marketing category for its work on the Scott-Macon Equipment website at the 21st Annual Communicator Awards, a leading international creative awards program overseen by the Academy of Interactive and Visual Arts (AIVA). 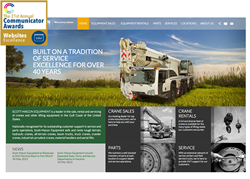 The website redesign features a modernized look that is simple and intuitive, while demonstrating the high quality of the Scott-Macon Equipment brand. Built for easy viewing, the site's responsive web design adapts to all device types and screen resolutions. The addition of the equipment catalog database allows users to search for available equipment and obtain detailed information, including product specifications, images, and downloadable data sheets. “We are thrilled to be recognized for our website development capabilities," said HexaGroup President Arnaud Dasprez. "We strive to meet our clients' marketing needs through our services and are honored to have that recognized by a competition of such distinction." Bob Dimmitt, Senior Managing Director at Scott-Macon Equipment, is proud to have smequipment.com recognized for its marketing capabilities and acknowledge the effort it took to produce such an award-winning site. “HexaGroup invested the time to understand our company and marketing strategies as well as the dynamics and competitive landscape of our industry before we ever entered the design phase of this project," he commented. "This approach allowed them to create a website that is incredibly responsive to our customer’s needs while maintaining the flexibility of design for future growth and marketing initiatives." Judged and overseen by the Academy of Interactive and Visual Arts (AIVA), The Communicator Awards entries are evaluated by their distinction in creative work, and on their merits against a standard of excellence based on the 19-year history of The Communicator Awards, considering the category entered. The 2015 Communicator Awards received more than 6000 entries from ad agencies, interactive agencies, production ﬁrms, in-house creative professionals, graphic designers, design ﬁrms, and public relations ﬁrms. The Communicator Awards is the leading international creative awards program honoring creative excellence for communication professionals. Founded by communication professionals over a decade ago, The Communicator Awards is an annual competition honoring the best in advertising, corporate communications, public relations and identity work for print, video, interactive and audio. The awards are judged and overseen by the Academy of Interactive and Visual Arts (AIVA), an invitation-only member-based organization of leading professionals from various disciplines of the visual arts dedicated to embracing progress and the evolving nature of traditional and interactive media. HexaGroup is an award-winning niche digital communications agency located in Houston, Texas that balances marketing and communications strategy, creative, analytics, tactical and technology expertise. Out-of-the-box creativity drives captivating design and content for websites, videos and 3D animation, while the agency’s strong Microsoft.NET practice propels software and web development offerings to new levels.